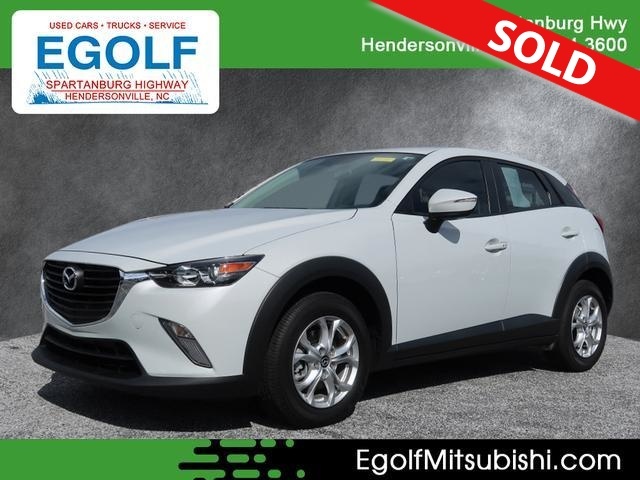 2016 MAZDA CX-3 AWD, AUTOMATIC TRANSMISSION, LEATHER INTERIOR, ONLY 20K MILES, CLEAN AUTOCHECK HISTORY REPORT, PLEASE CONTACT EGOLF MITSUBISHI SALES AND SERVICE @ 828-694-3600 FOR MORE INFORMATION AND TO SCHEDULE YOUR TEST DRIVE TODAY @ 1325 SPARTANBURG HIGHWAY, HENDERSONVILLE NC 28792. FINANCING AVAILABLE FOR ALL CREDIT TYPES!!. The CX-3 is all-new for 2016. Excellent fuel economy; sporty handling; quiet at speed; attractive, high-quality interior with appealing features. Subcompact crossovers haven't been around for very long, but there's already a critical mass of competitors for the CX-3 to check out. Tops on the list is the 2016 Honda HR-V, which lacks the CX-3's quickness and agility but counters with comparable fuel economy and superior cargo capacity. You've also got the Fiat Chrysler cousins, the 2016 Fiat 500X and the 2016 Jeep Renegade, with the former offering Italian flair and the latter boasting real off-road ability. Another rival worth trying is the venerable Nissan Juke, which is the quickest of the bunch in a straight line but has comparatively little interior space. They're all worthy candidates, but the 2016 Mazda CX-3 keeps them honest with its strong performance across the board. The 2016 Mazda CX-3 is a five-passenger subcompact crossover SUV available in Sport, Touring and Grand Touring trim levels. The base Sport starts with 16-inch steel wheels, automatic headlights, dual exhaust outlets, a rear roof spoiler, variable intermittent wipers, cloth upholstery, push-button ignition, a height-adjustable driver seat, a tilt-and-telescoping steering wheel, full power accessories, cruise control, air-conditioning, Bluetooth (phone and audio), a rearview camera, a six-speaker audio system (with a CD player, a USB port, an auxiliary audio jack and Aha/Pandora/Stitcher Internet radio), voice controls and a 7-inch touchscreen interface with a redundant rotary control knob on the center console. The Touring adds heated mirrors, a blind-spot monitor with rear cross-traffic alert, keyless entry and ignition, a front-row center armrest, leatherette (premium vinyl) and cloth upholstery, heated front seats and a leather-wrapped steering wheel and shift knob. The Grand Touring adds 18-inch alloy wheels, adaptive LED headlights, LED foglights and taillights, a sunroof, upgraded instrumentation, a head-up display, leather and synthetic suede upholstery, a navigation system, automatic climate control, steering-wheel-mounted paddle shifters, a rear cargo cover and a seven-speaker Bose audio system with HD radio and satellite radio. If you want a CX-3 Touring with a little more luxury, you can add a Premium package that includes the Grand Touring's sunroof, rear cargo cover and Bose audio system. Offered solely on the Grand Touring is an i-Activsense package that includes automatic high beam headlight control, automatic wipers, lane departure warning, adaptive cruise control and a forward collision mitigation system with automatic braking. The 2016 Mazda CX-3 is equipped with a 2.0-liter four-cylinder engine rated at 146 horsepower and a matching 146 pound-feet of torque. A six-speed automatic is the only available transmission. Front-wheel drive is standard, with all-wheel drive offered as an option on all trim levels. In Edmunds performance testing, a front-wheel-drive CX-3 Grand Touring accelerated from zero to 60 mph in 8.5 seconds, a quicker than average showing for this segment. EPA-estimated fuel economy checks in at 31 mpg combined (29 mpg city/35 mpg highway) with front-wheel drive and 29 mpg combined (27 city/32 highway) with all-wheel drive. On the Edmunds real-world driving loop, our front-wheel-drive test vehicle achieved a solid 31.4 mpg. Every 2016 Mazda CX-3 comes standard with antilock brakes, stability and traction control, front side airbags, side curtain airbags and a rearview camera. As noted above, the Touring adds a blind-spot monitor with rear cross-traffic alert, while the Grand Touring can be equipped with an i-Activsense package that includes advanced technologies like a forward collision mitigation system with automatic braking. In Edmunds brake testing, a front-wheel-drive CX-3 Grand Touring stopped from 60 mph in 121 feet, a slightly shorter than average distance for the class. The 2016 CX-3's cabin shows excellent execution overall, with high-quality materials and a sleek dashboard that conveys style and sophistication. The Grand Touring's large central tachometer and integrated digital speedometer are easy to read and look great; the head-up display looks tacked on, however, and lower trims must make do with a more ordinary gauge cluster. All trims benefit from a 7-inch touchscreen interface. It has crisp graphics, and we like the handy auxiliary control knob on the center console, though we've found that certain simple tasks -- switching between satellite radio stations, for instance -- require multiple steps to accomplish. The CX-3's front seats deliver outstanding comfort for this segment, with pleasantly firm support for long hauls and ample lateral bolstering for spirited drives. As with most subcompact crossovers, rear passenger comfort depends on who's sitting in front -- if you're behind a tall person, you'll likely find legroom to be in short supply. Cargo capacity in the CX-3 is decidedly modest, checking in at 12.4 cubic feet behind the rear seats and 44.5 cubes with the rear seatbacks folded down. That's with the standard stereo, by the way; if you get the Bose system, its trunk-mounted subwoofer reduces those numbers to 10.1 and 42.3, respectively. For context, the HR-V can swallow up to 58.8 cubic feet of stuff. The 2016 Mazda CX-3 is definitely a top athlete in this class, rivaled only by the turbocharged Juke. Handling is exemplary thanks to precise steering and nimble reflexes. The 146-hp engine sounds rather coarse above 4,000 rpm, but it gets the job done, serving up above-average acceleration in tandem with the smooth and responsive six-speed automatic. In day-to-day driving, the CX-3's ride is on the firm side, especially with the Grand Touring's lower-profile 18-inch tires. If you're considering that trim level, we'd suggest that you try out a Touring, too, with its smaller 16-inch rubber. Either way, road and wind noise levels are low compared to class norms, contributing to the CX-3's premium feel.